The gearbox crunched, the engine roared and the van shot up the M32 into the night. I was at the wheel with my friend Jo sat next to me. Both novice van drivers, we were nervous about the two-day 900-mile round trip from Bristol to the cottage in Portavadie and back ahead of us. Little did we know a blizzard would be thrown in to boot. Yup, it really was that snowy. In March. After a night in a seamy Travelodge near Carlisle, we were up and off at first light, strong coffee steaming in our cup holders. Crossing the border, slowly, almost imperceptibly, the rain turned to snow. By the time we’d hit Glasgow, it was a white out. We pushed on through, catching the ferry from Gourock across to Dunoon. From here on in you leave the world behind. The roads become single track, the mountains more rugged, the farmhouses more remote, the colours more intense, the sky bigger. And it was all sprinkled with snow. The A8003 rises dramatically above the sea lochs to reveal the Kyles of Bute, the silvery fingers of water that separate the Cowal Peninsula from the dark shores of The Isle of Bute. This is possibly one of the most beautiful views in Argyll. I’ve seen it a hundred times or more, but it stills makes my heart swell. Jo was momentarily and uncharacteristically speechless. The cottage was as it always is: unchanging and perfect. It had over-wintered on its own, so I’d expected mouse or damp-damage – the outside to have moved in so to speak. But all was well. One neighbour had popped in to turn on the electric heater in the bedroom. On the other side, a lovely retired couple have moved in. She made us tea and her husband helped us unload the van. My grandfathers bureau. A great spot for writing. 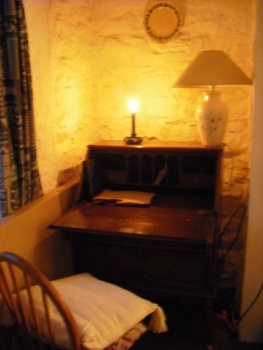 My stuff fitted perfectly into the cottage, and I found a great spot for my grandfather’s writing bureau. It’s a dark, heavy old thing with squeaking hinges that’s never looked quite right in my past houses. I’ve lugged it around for years anyway; now I know why. We slotted it into the alcove by the fire next to the window and I felt like it had come home. I’ll enjoy sitting there writing, looking out to the loch for inspiration. It’s across these waters on Bute that my grandfather lived most of his life and where he’s buried. He was a character by all accounts. He died before I was born, so I never got to find out for myself. But I can sit at his desk and imagine him and his self-reliant ways, living in his croft and looking after his shire horses – his life’s work and his greatest love. With everything unloaded and in, I lit the fire. As the wood crackled and the fire danced into life, I sank into the sofa and exhaled. Jo had a bottle of red wine warming by the hearth. We toasted the cottage and drank to dreams.